My name is Dorsey. Dorothea is on my birth certificate. Dorothea was the daughter of my Dad’s namesake: Peter Livingston Edwards. After giving me the name, he called me Dorsey. I can count on both hands the number of times I have been called Dorothea by anyone. “Dorsey” suits me. I have always liked it, partly because my Dad gave it to me. It’s part of my story. My Dad also gave me a photograph of the first Dorothea Edwards. She died at age fourteen of tuberculosis. I know only a little about her other than that. She lived in Africa because her father was an explorer or a trader of some sort. This name is part of my story. It is partly why I am a storyteller. You can probably see how this information stirred my own imagination. Until I was 7, we lived on a farm in the tiny house where my dad was born. His mother, Agnes, was a nurse. She was the only medically trained person within a 50-mile radius. She took care of all the farmers and ranchers and their families. Dad remembered being awakened in the middle of the night to drive the horse and buggy wherever she needed to go to birth a baby or treat some other emergency. He admired his mother. She was loved deeply. Though she died when I was 2 years old, I felt as if I always knew her. Our family was given a great deal of respect because she had helped many people come into our community. The adults in my growing-up years often told me her stories. My maternal Grandmother, Helma Salke, came to Deadwood, South Dakota to work for a distant relative when she was 11 years old. She was born in Finland, chosen by her parents to receive the blessing of a better life in America. She was sent here partly because she was a girl who could not contribute as much there. I often thought how lonely she must have been. She was a sweet grandmother. There was always a kind of melancholy loneliness in her eyes. Her stories of Finland made a deep impact on my young mind. 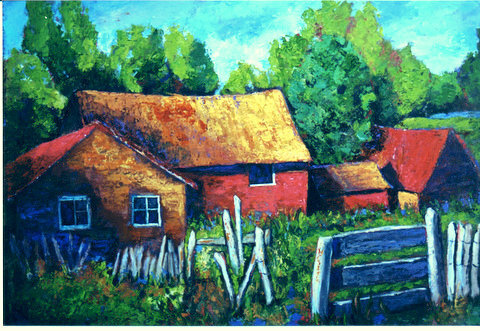 When I try to figure out where the yellow houses and red roofs in my paintings come from, she gets the credit. Her stories were planted in my heart very early.